Map: Route through North America. Pack List, Americas bike tour. Autumn time, the trees are those colors reminiscent of home in fall, or months and a year ago in Colorado. Walking, leaves scrunch underfoot, each step pushing down into the dirt tattered pieces of that carpet. The sun crests low in the sky each day. Breakfast generally happens once it’s light enough out that surely the sun must be up, but we’ll sit outside by the stove warming coffee and it’ll still be an hour before sunlight actually reaches and warms us. Paul pronounced a few weeks ago, “There’ll be a time when the sun comes out but it’s not actually warm.” We’re not there yet, but we’re getting close. Patagonia is here, now, we’re in it. It lies way down south in Chile and Argentina, but north of Tierra del Fuego. Ushuaia is in Tierra del Fuego. Ushuaia is our end. We’re getting close to that too. 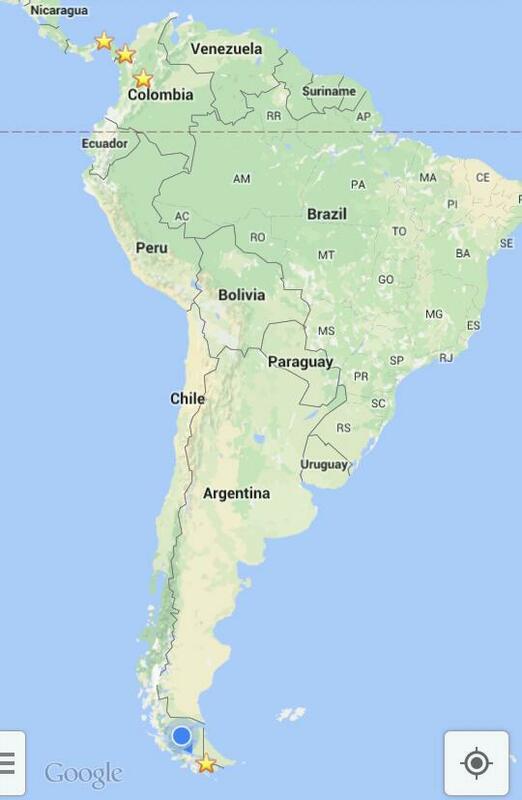 Patagonia takes up space in two countries, showing two different faces. Here the last peaks of the Andes thrust up incongruously against the pampa. Mountains versus plains. Moisture blows off the Pacific and the mountains trap it all, leaving the Chilean side covered with mist and rain but the Argentinean side generally cold and barren. There stretches the pampa, endlessly. Short shrubs and sharp grass punctuate the emptiness, but it’s on the pampa that the wind dominates. Wind could be an enemy or a friend on the bikes, but we cower from it at night in the tents. To get away, we slept for one night on the tiled floor of an uninsulated building. There was a night spent on the floor of a construction garage hanger, another in a road crew’s camp. The road crew had rooms partitioned off inside an unused semi trailer, luxury. They had another building erected with a roaring fire inside, brought us inside to cook and eat and passed around chairs and mate. They’re used to receiving cyclists. At the first construction site, they were used to seeing cyclists too, but maybe, at the end of this year’s season, a little tired of putting up with us again and again. Another night, we inflated our thermarests in a wood shed, cleared enough logs to stretch out the legs, and that was enough. There was a night sleeping on couches in a brand new but unused bus station lounge. The normal cyclist campspot in that town was the walled confines of the children’s playground next door. We tried the door of the bus station lounge instead, it was unlocked, no one cared, so we slept there. 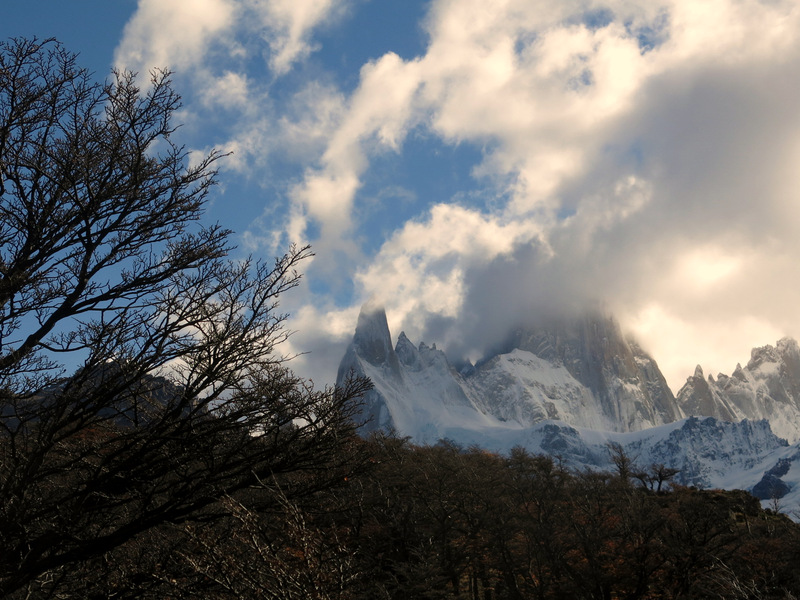 Patagonia is one of those places where the environment seems so dead set against you that the few people living here form community through hardship and help each other out. We hitched a ride with a couple that needed fuel for their car, but the gas station was closed, so instead they borrowed some gasoline from the park ranger station and when filling their tank, spilled some over their clothes. ‘La vida Patagónica,’ they shrugged and said. Why worry about things that don’t cause anyone harm? So of course we can sleep on couches that no one else is using. Somebody ought to. We personify Patagonia as one of those lands that are tough, it’s a fighter, and in turn we’re fighters too to press on through. We’re fighting long distances under short daylight hours. Keeping up strength with few opportunities to rest. Taking advantage of blue skies cloudless days that unpredictable weather could change at any moment. Add some fat to our diets to keep the bodies functional, we just need to eke out performance for a little while longer. Do you ask what it feels like to be so close to the end? There are some mixed feelings. But too there’s a sense mentally that riding to Ushuaia was the task set so long ago, and it’s time to complete that goal. There are things to look forward to in the months, years, after this trip is ‘over’; time committed to other projects and spending time at home and then back to Stanford. There was good news about Stanford a few weeks ago, confirmation of receiving a teaching assistant position- another long-term goal- so there’s a lot of excitement to be heading back to that community. There’s excitement to having a place to live for more than just a few days and all the opportunities that entails. There might be some lingering nostalgia towards wanting to be back on the road at the end, but that’s life, we’re always trading one set of opportunities for another. One more week of riding. Welcome to the end of the world. Photos to come in a week or two, but electronics are dying left and right. We’ve got one camera, but no post-processing tools, so hopefully the laptop left in Santiago is still there waiting for us when we return. ← The Carretera Austral, part 1.
hang in there, Sam!! Best of luck in the last part of your journey. Thanks man! Emailed you some notes on framebags, excited to see how it turns out! Woo thanks! Markets together soon? Merci merci! And happy birthday Marion! Not so many of us left down here now. Let me know if you guys are ever back in the States again, we ride tougher stuff on fatter wheels! Sam, I’ve enjoyed your adventure and living vicariously through (most of) your adventures. Living the dream! I’m sure all you’ve seen between Alaska and Chile/Argentina will be imprinted in your mind and make for great stories by the fireplace with your grandchildren one day! I do look forward to you publishing your pictures and blog into a book. There’s not that much non-fiction travel literature for the arm-chair traveler. Enjoy your last miles! Thanks Allen! Looking forward to seeing everyone soon! Looking forward to a Sunday morning breakfast one of these days soon! The Carretera Austral, part 1. Scott Pauker on To Copahue. Inspiring Quotes for… on Bolivian Altiplano, Lagunas. The long way around… on To Copahue. friend on Coffee and an empanada.